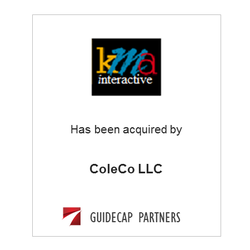 KMA Interactive, a developer of CRM software, has been acquired by a ColeCo LLC. The sale will position KMA Interactive to continue its rapid growth and expand into additional market segments. ​GuideCap initiated the transaction, served as the financial advisor, and assisted in negotiations for KMA Interactive.